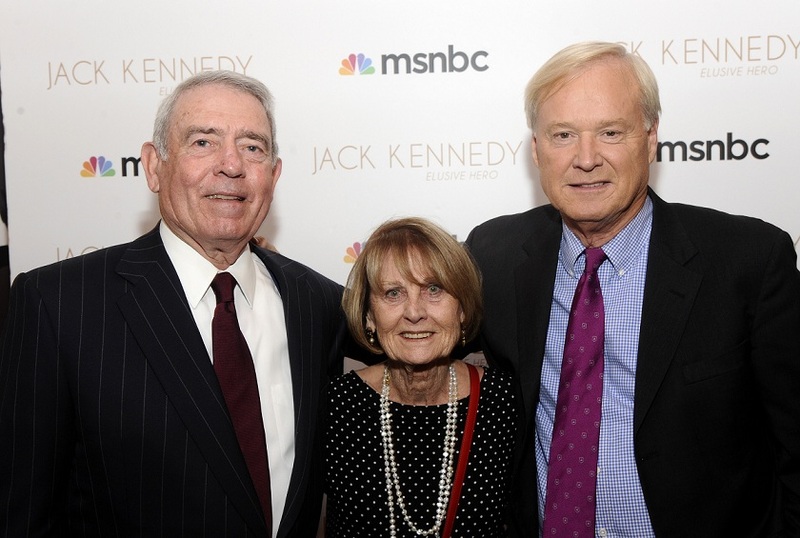 As part of our one-part series Project: In Vino, Mediaite set out to capture media elites, gathered to fête Hardball host Chris Matthews‘ Jack Kennedy: Elusive Hero, in their alcohol-lubricated natural habitat, and maybe to drink some of it ourselves. With the aid of a hidden camera, I ventured to MSNBC’s book party Tuesday night to tear the lid off of this den of open bars and Wagyu beef hors d’oeuvres. Unfortunately, I hid that camera so well, I still can’t find it, but since I cleverly brought along an unhidden camera to throw the benighted journos off, the evening wasn’t a total loss. The party was held at the Gramercy Park Hotel, which, while fancy, also possesses an undeniable schmanciness as well. When you walk in, there’s no sterile check-in counter, just one guy behind a low antiquey table with a guest book on it. I thought he was just waiting for someone to bring him a latte. I got there an hour-and-a-half early, not so I could secure on-street parking, but for some other good, strategic reason. Luckily, the Gramercy Park Terrace (or The ‘Rrace, as I like to call it) was open to the unfashionably early, so I went up to get the lay of the land. There, I was met by an MSNBC PR staffer, who showed me around, and got me a copy of Chris Matthews‘ Jack Kennedy: Elusive Hero to peruse while I waited. I also finally got to meet some of the MSNBC PR staff, whom I’d only ever spoken to via phone or email. In fact, it looked like MSNBC’s entire PR staff was there. If they were cops, I’d have been out robbing a bank. The ‘Rrace is a lush, zen-like space with two open bars (! ), lots of plants everywhere, and a muted, nature-themed decor. I took a few pictures, grabbed a Diet Coke (the bartender informed me that it takes more skill to pour one of those than any other drink), and sat down to read Matthews’ book until the partygoers arrived. One of the first to arrive was MSNBC President Phil Griffin, followed closely by Mediaite Managing Editor Colby Hall (also a Project: In Vino operative), both of whom headed straight for the bar. That was my cue to grab a glass of champagne, just to blend in, you see. Michael Calderone was another early arrival, whom I hadn’t seen since the last media-elite book party I’d infiltrated, for Bill Press‘ Toxic Talk, so we spent some time catching up. Since then, Mike has gone from Yahoo! News over to The Huffington Post. Also in attendance was the lovely and talented Ann Curry, who was also at the Mediaite launch party. In fact, there were quote a few Mediaite launch party alums, including Willie Geist (who claimed to read Mediaite every morning, and passed a quiz to prove it), and broadcasting giant Dan Rather and his wife, Jean (who really like the vibe of the ‘Rrace). In that way, these things are kind of like summer camp, but with better S’mores and booze. Other luminaries in attendance included comedy legend Jerry Stiller, New York Times media wunderkind Brian Stelter, Game Change co-author John Heilemann, MSNBC anchor Tamron Hall (no relation to Colby), Andrew Ross Sorkin, PBS’ Charlie Rose, and a couple of my White House comrades, Renegade author Richard Wolffe and newly-minted MSNBC dayside star Alex Wagner. Wolffe asked after my bum ticker, but I caught the subtext. He was obviously trying to enlist me in some sort of scheme to promote socialized medicine, so I played along. I congratulated Alex on her new show, and after my second glass of champagne with no food, corralled Phil Griffin to let him know that whoever decided to give Alex her own show ought to be promoted. Any idiot can see her megawatt TV appeal, but she was also one of the hardest-working reporters on the White House beat for Politics Daily. In conversations with the denizens of this media ivory tower, there were a few consistent themes. Herman Cain’s recent troubles came up a lot, with the general consensus being that he could probably survive the scandal absent a flesh-and-blood accuser coming forward, but that his campaign needed to learn how to handle it better. James O’Keefe‘s recent activity was also the subject of some buzz, with requisite outrage over his treatment of Sam Stein, but also disappointment that his expose´s weren’t more interesting. A few people even expressed some positive feelings about the burgeoning prime-time slate at Current TV, the feeling being that there’s room enough in the sky for two forward-leaning lineups to succeed. I set up my camcorder (which cleverly decided to ignore the fact that I had plugged a microphone into it), and antsily waited for Matthews to return. With a three hour drive ahead of me, I guess impatience got the better of me, and after a few minutes, I started angrily composing tweets in my head about how Chris Matthews had ditched me at his book party. Fortunately for me, he showed up shortly thereafter, and even though it was probably the last thing he felt like doing, answered all of my questions at length.